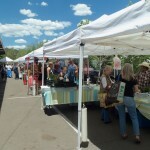 With summer comes the Flagstaff Farmers’ Market every Sunday at City Hall. We loaded the pups up in the truck and headed downtown. 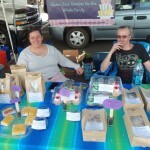 I caught up with my friend Kathleen, who had a booth set up selling delightful gluten-free treats from her business, Kat’s Cupcakes. I’m not a gluten-free type… I’m a garbage-eating omnivore, and I find her various breads, muffins, cupcakes, and so forth delicious! 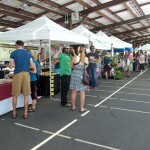 Sean and Kat hawking her delectable wares! Lettuce so beautiful, I wanted to eat it on the spot. 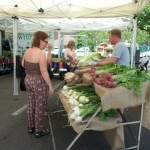 Locals shopping for produce with local farmers. We picked up treats from Kat, dark chocolate dipped crystallized ginger, gluten-free dog treats, and, of course what we actually went for, plump, delicious dates from Yuma. 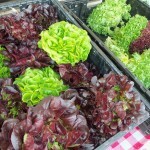 We forgot a cooler, so we had to leave the wonderful lettuces and sprouts behind. Afterwards, we took the dogs visiting at the bark park, went to Mama Burger for lunch, and finally to Old Cave’s Crater to let the dogs run around and chase pinecones. 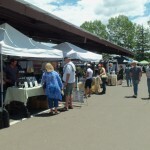 This entry was posted in Events, Flagstaff, Food and tagged dogs, downtown, events, Farmers Market, flagstaff, food by Deborah Lee Soltesz. Bookmark the permalink.